You already have a piano that has been in the family for years, but it's just not as much fun to play anymore. Did you know that you could trade-in your old piano for one of the new Yamaha digital pianos? Yamaha Pianos have been the leading choice for both professional musicians and educational institutions - upright mid-ranged pianos with both style and tone quality. Click Here to View Our Range of Yamaha Pianos. For example, the U1J series of Yamaha Pianos is well-known for its tonal qualities as well as being a beautiful instrument. You'll be impressed with the variety of colors you can find for your Yamaha piano - black, mahogany, white or ebony. Aside from its beauty though, the Yamaha digital piano is a lot of fun. You'll be the life of the party at your house when you start playing some upbeat melodies on your piano. You'll probably even get a sing-along started, which will bring some joviality to your party. But the first thing you need to do is get a piano into your home. If you already know how to play, you'll still find this piano to be a lot of fun because it has a whole new sound to it. Yamaha electronic pianos will be a big entertainment for your family. When you want the kids to play on the piano and not disturb the rest of the household, all you have to do is press down on the centre pedal and it switches from acoustic piano to silent piano. You have two stereo headphone jacks so you can have two children playing on the piano at the same time, both with stereo headphones on their ears, and they can hear what they're playing but no one else will hear it. They can practice playing the acoustic piano silently anytime, day or night, without disturbing anyone in the household. If you had your heart set on seeing some Yamaha grand pianos, you'll find those as well. There is nothing so breathtaking as a grand piano. It's tone is the very best and it's a magnificent looking instrument. Nothing will make a room look so beautiful as a grand piano. And if you're a connoisseur of musical instruments, you'll know that you have the best when you get a grand piano. You can find so many Yamaha pianos for sale. All you have to do is make a choice. 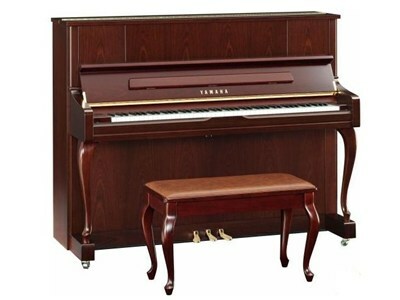 Take a look at our website at PrestigePianos.com.au and see the variety of pianos that you have to choose from online. Then find our address, which is on our website, and come and visit us.